Welcome to A Sampling Bee! 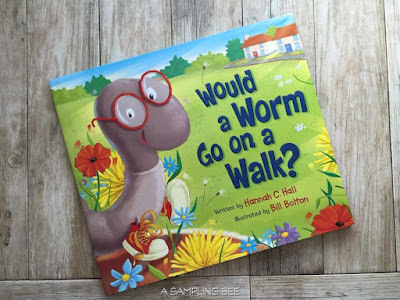 Today, I share with you a cute children's book called Worm on a Walk! This book is written by Hannah C. Hall and is illustrated by Bill Bolton. I really love this book. It's bright an colorful and shows our children that they are special and important. My family enjoys reading Worm on a Walk before bed every night. The Worm on a Walk book makes a great gift. Enter to win a copy of your very own below! “Would a worm go on a walk, if you could lead him down the street? / Would he wear his tiny tennies, if he had two worm-sized feet?” So begins this humorous and imaginative picture book that introduces children to the idea that animals are uniquely created by a loving and wise God. Would a Worm Go on a Walk?, with its colorful, comical illustrations, is a fresh, fun way to teach young children that God created all things very good. He gave all the animals, and children, too, wonderful qualities and unique strengths. Children will giggle over the ridiculous scenarios presented, and they will come away with the knowledge that we all are loved and special. Night and God Bless Our Christmas, as well as an award-winning blog, HannahCHall.com. Disclosure (in accordance with the FTC’s 16 CFR, Part 255: “Guides Concerning the Use of Endorsements and Testimonials in Advertising”): Many thanks to Propeller Consulting, LLC for providing this prize for the giveaway. Choice of winners and opinions are 100% my own and NOT influenced by monetary compensation. I did receive a sample of the product in exchange for this review and post. Only one entrant per mailing address, per giveaway. If you have won a prize from our sponsor Propeller / FlyBy Promotions in the last 30 days, you are not eligible to win. Or if you have won the same prize on another blog, you are not eligible to win it again. Winner is subject to eligibility verification. US & Canada ONLY!